Pre-heat oven to 240°C/460°F. Halve bell peppers and remove the core. Wash tomatoes and peel onions. Quarter bell peppers, tomatoes, and onions. Add vegetables together with olive oil to a large bowl, season with salt and mix well. Transfer sliced vegetables together with the garlic and chili peppers to a parchment-lined baking sheet and bake in oven at 240°C/460°F, using the grill function, for approx. 15 min. Remove from oven and turn vegetables, make sure to turn the bell peppers skin-side up. Place back into the oven and bake for approx. 15 – 20 min. more, or until vegetables turn slightly brown. Remove from oven. With your fingertips, press roasted garlic out of its peel. Finely slice roasted vegetables, chop garlic, and add to a bowl. Juice lemon. Add cane sugar, lemon juice, and remaining olive oil to the bowl, season with salt and pepper, and mix thoroughly. 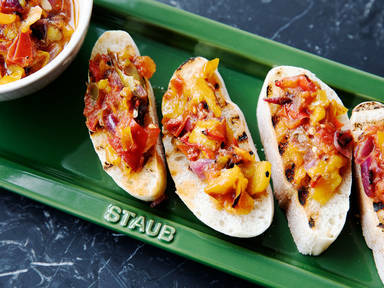 Serve on freshly toasted ciabatta bread and enjoy!